I posted a few weeks back about an 'extra marital dating agency'. 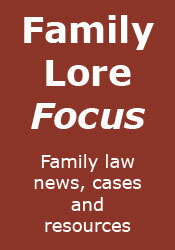 Well, it appears that another such agency, Marital Affair (slogan: "Adult Dating where the grass is always greener"), has attracted the adverse attention of a facebook group created by Jon Kuhrt, an employee of a Christian charity in London (my thanks to Andrew Woolley of the Family Law Blog for the heads-up on this). 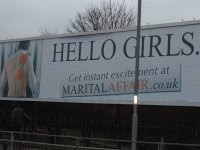 The group, Stop marital affair .co.uk advertising publicly in the UK, takes particular exception to the billboards that Marital Affair have, ahem, had erected around the country. The billboards show a picture of a man with no shirt on and a bra over his shoulder and have the caption: "HELLO GIRLS. Get instant excitement at MARITALAFFAIR.co.uk." Kuhrt says that he "can't think of anything more irresponsible that could be advertised" and claims that the site is "feeding on people's weaknesses and helping them to lie and ruin their own as well as their partners, and their families and children's lives". He accepts that such sites will always exist, but says that "we do not have to tolerate their advertising in public places". The group, which has attracted over 3,500 members (as at the time of writing this post), made a complaint about the billboards to the Advertising Standards Authority, but this was rejected by the Authority, as "the poster's content and presentation were not explicit and it was unlikely to cause serious or widespread offence or be seen as irresponsible". A quick look at the facebook group indicates that they do not consider this to be the end of the matter. Meanwhile, it has been pointed out that this whole 'affair' (pun intended) could actually be even better (and certainly cheaper) advertising for the agency than the billboards themselves. For myself, I tend to agree with Andrew Woolley. Whilst I may find the whole idea of extra marital dating agencies to be somewhat seedy and unpleasant, the ultimate responsibility for the damage done by extra-marital affairs lies, of course, with those who have the affairs, rather than any agency - I would have thought that the 'clients' of such agencies are surely likely to have affairs anyway (if they haven't already), and that the existence of such agencies would not therefore seriously increase the number of people having affairs... would they?